Colorful, attention-getting tape helps identify cartons or inventory. 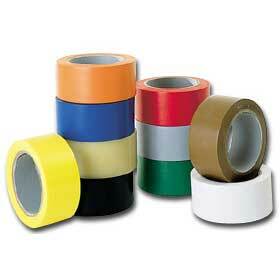 Colored poly tape helps to eliminate mix-ups and speeds shipments. Ideal to control dated inventory, product coding and location. Super-adhesive tape goes on fast with hand-held dispenser. Available in Red, Black, Yellow, White, Blue, Green or Orange - please specify. FOB Shipping Point. Above prices reflects case pricing.